When Trevon and I got married I was not the planner in the relationship. I liked to do things more on a whim and Trevon always wanted to have a plan and a schedule. That didn't change completely after getting married, but I learned quickly that it's best to have a plan when it came to meals and a list for grocery shopping. Meal planning became part of our regular routine. When we first got married, we would both get home from work and try to find something for dinner and we would always end up frustrated because we were hungry and didn't have what we needed to make a meal. Trevon started telling me that I should write down a list of things I need at the store to make dinners so I wouldn't forget things (sometimes I still forget things even though I make a list now). And then we quickly realized that in order to make a good grocery list, I needed to have an idea of what we wanted for dinners that week. It surprised me that he was the one that was a little bugged by this because he had mentioned that his family rarely ate dinner together, while my family had dinner together every night. Being newlyweds, we decided that we wanted to be able to cut back on spending somewhere and decided that groceries were a good place to start. We tried the extreme couponing thing and at first, we decided it was a really great idea. Build up food storage and save some money while we were at it. It required some work though, and eventually, we decided to quit doing that because it wasn't working like we hoped. We ended up buying so much junk food that never filled us up instead of healthier, good food. We were spending a lot of money on things we wouldn't normally buy too, like pop tarts, just because it was a good deal. So we quit doing that. After a few years of living with family, we moved into our own place and when we did that, we really needed to save extra money! Then one area that we could see easy potential in saving was, again, groceries. So we really got down to business on what we needed to buy instead of what was a good deal. The best way for us to do this was to plan our dinners for the week, and write a grocery list that was easy to stick to. So, every Sunday, we sit down and meal plan by making a list of things that we want to have for dinners that week. We ask the kids what they want, and we go through the schedule and see if we have any plans that would cut out any of the dinners (like if we had plans to go out with friends, or a family dinner party). And we look at the grocery store ad to see what is on sale that we actually use and need to stock up on. 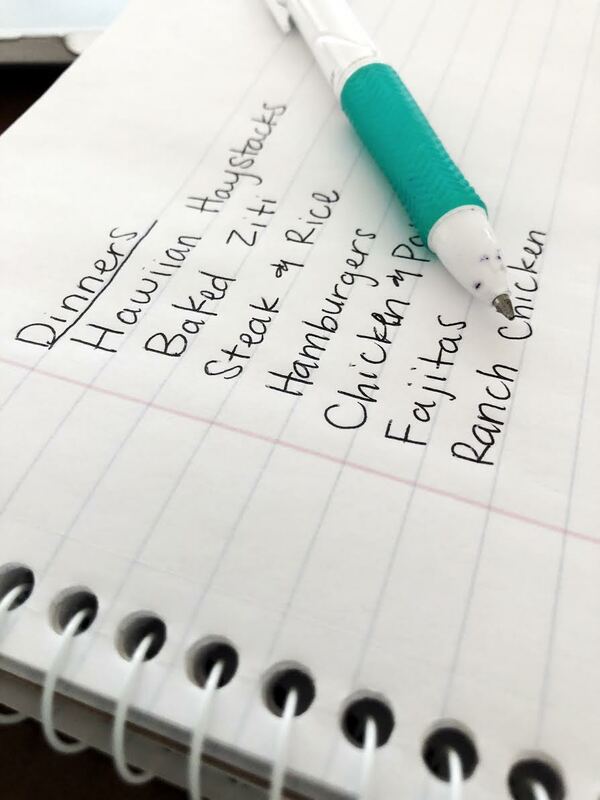 Once the dinner list is done, we start on the grocery list. We go through and see what we need to buy for those dinners. From there we add things that we will need for all of our lunches to the list. We see what we are out of in the fridge and in the pantry and put that on the list, and then produce, and snacks. Then I put the dinner menu and the grocery list on my phone in the order I would get them at the store. This makes shopping incredibly easy. I only go down the aisles that I need to go down. We avoid the candy/snack aisle and the pop isles always (unless there's a treat we need to take for school or for a holiday) so it's really easy not to impulse by treats that we don't really need. I can honestly get the grocery shopping, from the time I get in the car to the time I get back home (kids and all), done in 30-45 minutes if I put my list in order. It's become a really easy routine. Meal planning and making a grocery list has saved us so much money! We are a family of 5, and we are spending around $130 a week at two stores (on a week where we have a lot to buy) We don't use coupons, I do use the Ibotta app, though, which is a rebate app for groceries. We just stick to the list of stuff we know we need to get. We very rarely impulse buy this way and most of our food is produce. I remember hearing some of my married friends talk about how much money they spend on groceries a week and I never understood how a couple without kids could spend $300- $500 a week!? Meal planning also makes making dinner really easy. I just look at the list and see what we have left on there and pick what we feel the most like that night. This helps us to get dinner on the table by 6:00 and stops us from spending a lot of money on takeout. There are days that I don't feel like cooking or that we don't want anything on the list. And on those days we have "find it yourself night" which means the girls have chicken nuggets and Trev and I normally have a bowl of cereal or leftovers. So, now that I've been doing this meal planning thing every week for almost 6 years, I guess that kind of makes me a planner. It doesn't have to be fancy. It doesn't need to be a menu board or scheduled out day by day. If that's what works for your family, great! But it can be as simple as writing it down on a piece of paper like we do. 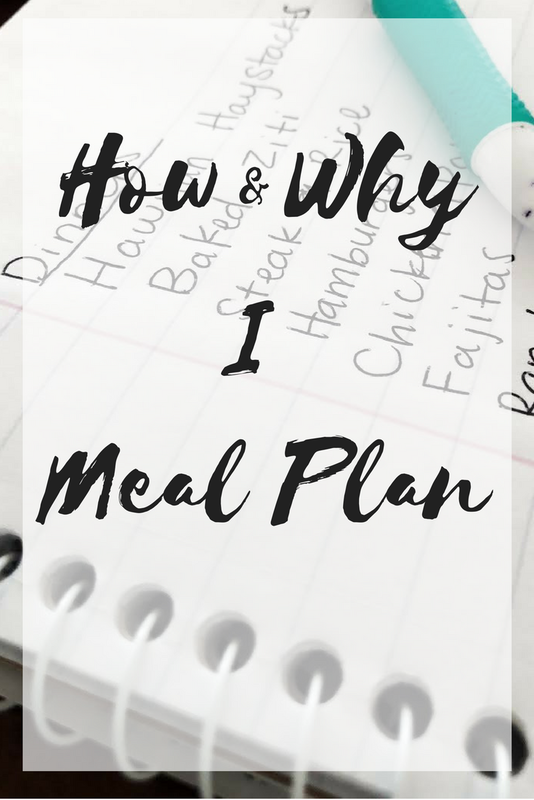 I still like to be spontaneous or a little more relaxed with other things, but making dinner and grocery shopping has been so much easier since we started to meal plan. 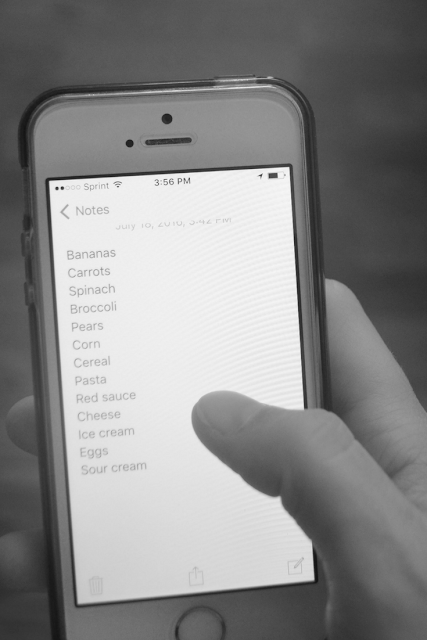 Do you have a grocery list every time you go to the store? What is your most used dinner recipe? I always bring a list, go through my coupons after I make my list, then use the digital coupons for my local kroger store. And maybe once a month I get a great deal- the rest of the time I know we spend too much. And then I look in the cupboard and can't figure out a meal with what we have- and what we have goes to waste! I never saw my parents meal plan even though we ate dinner together EVERY night. My mom never really did meal planning either, she would decide at the store what looked good and get everything from there. But I can't ever remember what we need unless I can check and write it all down before hand. It does take a little time, but once you get in the habit of it, it goes really fast. I meal plan because I'm a terrible cook and I hate shopping. When I say I'm a terrible cook, I mean that I can't just look in the pantry and say, "You know what? A, B, and C would taste really good together - I think I'll whip something up right now!" I need a recipe or I can't make it. But I also hate shopping so there's no way I'm stopping by the grocery store every day or two to get what I need for that day. I go once a week, and that's enough! This is how my mom does all of her grocery shopping. I kind of picked up the habit when I moved away from home and love it. I'm totally not a planner, but I love this idea! I keep my grocery list on my notes app too! Love meal planning! Takes the guesswork out of dinner! (We are a family of 5 too...can't tell you how many nights I just make scrambled eggs LOL)! breakfast for dinner is one of our main meals haha. It's easy and quick and everyone loves to eat it!